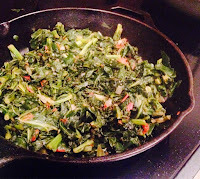 When I had a chance to spend a few weeks in Kenya last May, one of the local foods that I really enjoyed eating was a dish of greens called sukuma wiki- I mentioned this dish several times in that post. Sukuma wiki uses the local greens (colewart) and it is in the spirit of the dish to adapt it to any greens that are locally and cheaply available. In my case, it was kale bought on sale at the supermarket. It is flavored quite simply- like all the everyday Kenyan food I tasted- with onions and tomatoes, and salt. Nothing more. 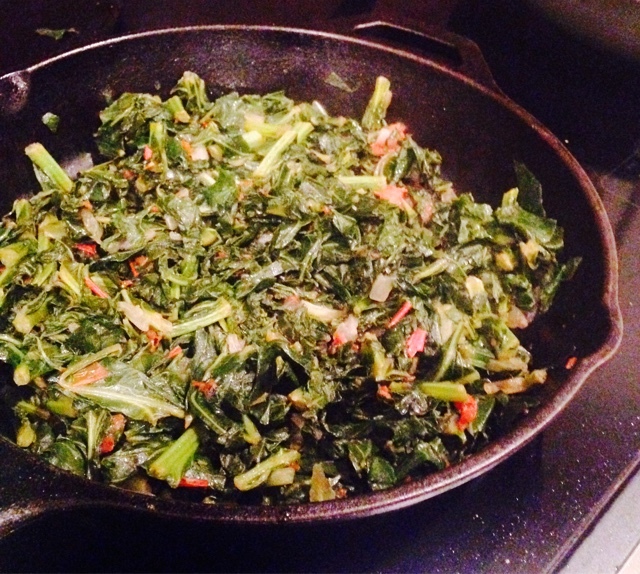 Here is my not-really-a-recipe recipe for sukuma wiki. I use my cast iron skillet for this. 1. Wash, trim and shred or finely chop a heap of greens. 2. Heat 1 tbsp. oil. 3. Saute 1 medium chopped onion and 1 medium chopped tomato for a few minutes. 5. Add greens and stir fry. 6. Cover and cook for a few minutes until the greens are tender. I resist the temptation to add turmeric, chili powder, cumin and so on to this dish. Not that it would be a bad thing to turn this into a typical pale bhaji. But the simplest form brings back memories of being in the African market and buying big handfuls of shredded greens from the kanga-clad vegetable sellers, and of helping my colleague stir a pot of sukuma on the tiny stove in his bachelor kitchen. Sukuma wiki goes with everything. It is nice to make a batch and keep on hand in the fridge, then use it in different dishes and as a side-dish for various meals. Rice and lentils are the classic companions for this dish, but we've eaten it with everything from instant noodles to spaghetti sauce. My favorite way is to eat it for breakfast like this: Heat a small tortilla on a griddle (I like low-carb tortillas from Trader Joe's). Top with some mashed avocado, hot sauce, a heap of sukuma wiki and a fried egg. Fold over and enjoy the breakfast wrap. What a perfect way to start the day. I eat a lot of avocados. I used to get very frustrated buying avocados because half of them would turn out to to be brown and unusable on the inside. Then I discovered this life-changing tip. It really works. Now I peek under the stem of the avocado at the store and only buy the ones that look green under the stem, then a couple of days on the counter and they are ready to eat (and will last in the fridge for several days if you want to wait). 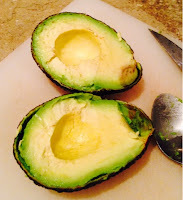 Now I have near-perfect avocados; the one in the pic below had a tiny brown spot but the rest was creamy green avocado. Over winter break, I was looking to sink my teeth into a juicy new mystery series, and remembered that someone had mentioned Elizabeth George- the author of the Inspector Lynley novels. I vaguely recall seeing a few episodes of the televised series on PBS years ago but had not read the books. I read the first two novels in the series and the writing is terrific. A Great Deliverance (Inspector Lynley, #1) which was a suspenseful and engrossing read but the ending was very disturbing. Payment in Blood (Inspector Lynley, #2) was a formula mystery- a theater production team in a remote castle is snowed in, there is a murder, one of them had to have done it and so on. I look forward to reading more of this series- have you read them? Another interesting read was the very recently published Between You and Me: Confessions of a Comma Queen by Mary Norris. V and I are avid fans of the New Yorker magazine; Norris has worked for the magazine for decades as a copy editor. The book is part memoir, part rantings and ravings of a grammar stickler, with lots of meditation on the quirks of the English language. As a kid, I loved reading Wren and Martin (a high school English grammar textbook)- not that you would know that from reading this poorly-proofread blog. Word lovers and grammar nerds will enjoy this book. My favorite quote from the book: "Job of copy editor is to spell words right: put hyphen in, take hyphen out. Repeat. Respect other meaning of spell: spell writer weaves". My favorite book this month was a work of non-fiction- A Path Appears: Transforming Lives, Creating Opportunity by Nicholas Kristof and Sheryl WuDunn. It is a large, highly engaging tome on the art and science of giving- on sharing money and time with local and global organizations to benefit our communities. Kristof and WuDunn present dozens of case studies of people and projects that help those in need- their successes, failures and challenges. They address complex issues- such as about overhead expenses and staff salaries in non-profits. Many of us are searching for a more meaningful life and this optimistic book provides encouragement and advice on how to make a difference. Auld Lang Syne, Kamini Dandapani's memories of her paternal grandparents' home, featuring "the strangest cast of characters, a terrifying bathroom and a belligerent buffalo named Lakshmi". Saapaadu Ready, Janani Sreenivasan's memories of travels with her mother's South Indian kitchen. "Take the best from all cultures. That's the best way of living I've found". What have you been reading, cooking and eating these days? Happy February! Thanks for sharing the fun info about sukuma-wiki. What does that translate to, by the way? Also, I felt the need to comment because I just read Auld Lang Syne, right in the middle of my work day, as a break between mind-numbing tasks. It's a heart-rending piece, sketched out with much feeling by the author. Thank you for sharing it. The world's best things are lovely and heartbreaking, all at the same time. Aarti- Sukuma wiki translates to "stretch the week", meaning a cheap and filling dish to stretch the food budget at the end of the week. Kamini has a wonderful way with words- I love so many of the essays and stories on her blog. I am so glad you read that piece. Great post! I can't wait to read those essays .. Added them to my pocket account! So another grammar book written in wry, British humor was "Eats Shoots and Leaves". This recipe looks great. That wrap makes my mouth water. Must eat that soon! If I come across other tips, I will certainly share them. Saapaadu Ready is such a delightful read! thanks for pointing to it. Love it when people take the best from all cultures to create a culture for their own. I so remember Wren and Martin! used to love reading it like a story book :) I am currently reading the tales of peter rabbit (by beatrix potter). I bought the collection for my son, but it is turning out to be such a fun read for me as well! I am currently in the Idly making obsession phase. I tried my hand for the first time, making the batter from scratch last month, and was pretty satisfied by the results. Then, after suggestions and tips from my south indian friends, I made it again with black urad dal and red rice and it turned out even better! One of my friends also gave me a recipe for chutney podi and tried making it, and loved it! Our 2 year old son is loving the idlis too, which is a big plus! Having moved to bangalore, I am literally in food heaven. I love south indian food and there is abundance of good eats here. Neha- how wonderful to be living in South India and getting to cook and eat the best of South Indian food! The Bangalore-style sweetish and coarse chutney podi is my favorite. My friend Cathy has been sending Lila the Peter Rabbit books and she loves them. 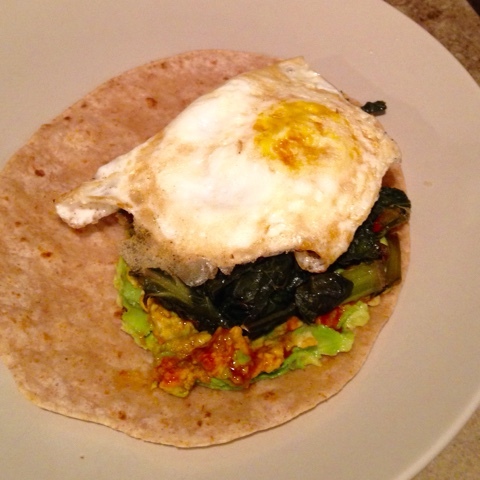 Love the idea of adding greens to the breakfast taco thingie. I started the year with a super long, emotional book called "A Little Life". After that one I needed a super light read. So, I'm currently reading the second book in the No.1 Ladies' Detective Agency series, Tears of the Giraffe and I am also listening to the audiobook version of Mindy Kaling's "Why not me?". Enjoying both so far. I bought Food52's Genius recipes cookbook a couple of months ago and have tried and loved quite a few of the recipes in it. Recent favorites were the Ginger Fried rice and Black Pepper Tofu. I've made Smitten Kitchen's Sticky Toffee Pudding thrice since the holidays for potlucks and once for a dinner at my place. Each time it has been a huge hit. It's the easiest thing to make and is basically a date cake with caramel sauce on top. Do try it if you are looking for a dessert recipe to try. Tastes the best when warm! Hi Anu- Reading the Mma Ramotswe books always cheers me up. I have Mindy Kaling on my to-read list- glad to know you are enjoying it. I will be bookmarking that sticky toffee recipe!! I might be able to get the Food52 book at the library- let me see. Hi Nupur! So good to see a new post from you. I have the egg-avocado-chapati wrap every morning (and that is exactly how I pick my avocados, I even taught a few fellow shoppers this trick) what a great idea to add greens to boost the flavor, nutrition and taste! Since its winter I also make steel cut oats occasionally, soaking them overnight and a good rolling boil in the morning but quickly get bored of the texture. Do you or your readers have any suggestion for using up steel cut oats? Can this be baked into some sort of savory squares? I've always wanted to try oats upma but haven't done that yet! I am surprised sometimes by how delicious some of the simplest, few-ingredient dishes turn out. Probably because they let the flavors of the few ingredients shine through. Sukuma Wiki sounds delicious, and I am going to give it a try with whatever greens I have right now in the refrigerator-- spinach, I think. I haven't been reading as much as I should, but I picked up a big armful of cookbooks the last time I was at the public library, including At Home With Madhur Jaffrey, which is not vegan or vegetarian but has some lovely recipes nonetheless. Desi and I have been binging on Murdoch Mysteries on Netflix, an absolutely riveting mystery series set at the turn of the 20th century in Toronto. Vaishali- I've been looking for a new mystery series to watch and enjoyed Murdoch mysteries' first episode last night! Oh that poor dog- glad she was OK. Thanks for the reco. Madhur Jeffrey's recipes are always interesting and inspiring- I have a couple of her cookbooks that I should use more. I loved the Saapadu Ready piece - so well written, and it really touched a chord. I love avocados and follow the same tip you have given! I really love avocado toast - avocado mashed with some salt, pepper, chilly flakes and lemon juice, and spread over a piece of top quality crusty toast drizzled with a touch of olive oil. Bliss! You are in for a treat with Elizabeth George's books! Love them. Great! I look forward to reading more. Hi Nupur. I loved your avocado tip. Very helpful. I have not read a Lynley yet but they sound good. I've watched the BBC drama of Tess of the D'urbervilles recently. It was so riveting. Also am reading more classics this year. George Eliot's Middlemarch and Dicken's Bleak House or on my to read list. Currently indulging in Anthony Trollope's Barsetshire series. Hope you have a great month. Arpita- I think you will enjoy the Lynley's. Not as cozy as Christie's but the writing skills are on par with PD James. Ooh I will look for the books you mention!